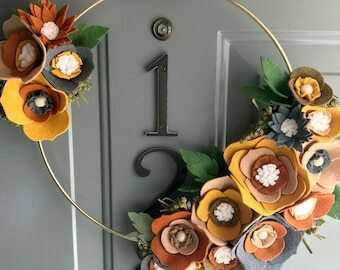 Handmade goodness made of felt, fabric, yarn, and happiness for you to enjoy! Please allow ~7-14 business days for your order to be ready to ship! Most orders are shipped on Saturdays. Wholesale & bulk inquiries always! You must ask permission before use. 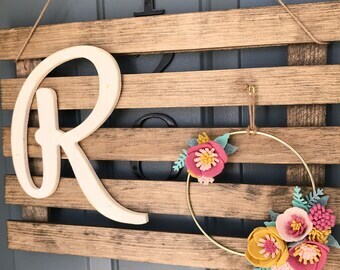 Wooden Rustic Farmhouse Handmade Door Wreath Wall Hanging Custom Base - Switch it up! 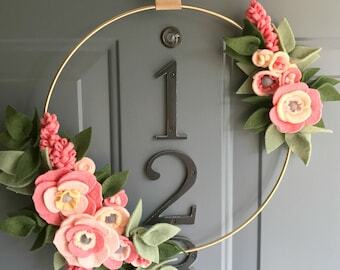 Felt Flower Wreath / Hoop / Floral Wreath / Fabric / Farmhouse / Modern / Handmade / Decoration : Spotlight 5"
Felt Flower Wreath / Hoop / Floral Wreath / Fabric / Farmhouse / Modern / Handmade / Decoration : Blueberries 12"
Felt Flower Wreath / Hoop / Floral Wreath / Fabric / Farmhouse / Modern / Handmade / Decoration : Peachy Keen 10"
Felt Flower Wreath / Floral Wreath / Yarn / Farmhouse / Modern / New Baby / Handmade / Banner / Bunting / Decoration : Baby Girl 12in. 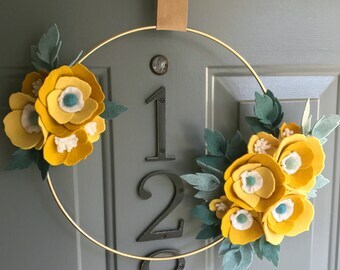 Beautiful wreath - looks just like the picture only better! Great modern country look! 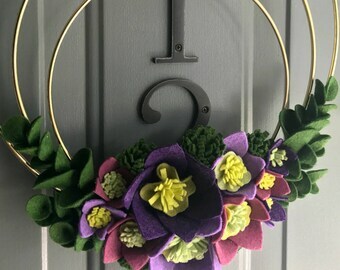 Super unique and fun wreath - the seller was also extremely helpful in tracking it down when USPS failed to leave a delivery attempt slip! So cheery. When the Christmas wreath comes down on Epiphany, this poppy extravaganza will go up for the rest of the year. Delightful & Christmasy. Very well made. Timely shipping. Wouldn’t hesitate to order from this seller again. 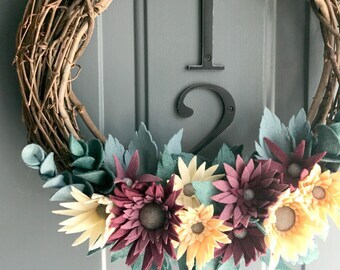 A crisp and bright design to heat up your Summer and warm enough to decorate your home throughout Autumn! If you are not completely satisfied with my work, please contact me within 7 days of receiving the item. Upon review, I may refund your cost (not including shipping) or exchange for another piece. You are responsible for return shipping costs unless I make a mistake on your order. If an exchange is made the buyer is also responsible for those shipping costs. Custom and Holiday items are non-refundable. If the item is returned and arrives damaged due to the way it was shipped back, the buyer may not be eligible to a refund for that item. Please pack items safely to ensure no damage. Payment must be made first before order is fulfilled. If necessary, money orders are accepted. If this method is chosen, please be aware that any order will not be fulfilled until money order has been cleared, so please expect a delay. Your purchase will ship within 1-2 weeks of payment and will be shipped by USPS. I ship on Saturdays. I don't refund lost packages. If you wish to have the package insured, please let me know before purchasing and the cost will be added on. I do not make money off of shipping and handling costs. International shipping is also through USPS mail. Delivery time on international orders usually takes longer. 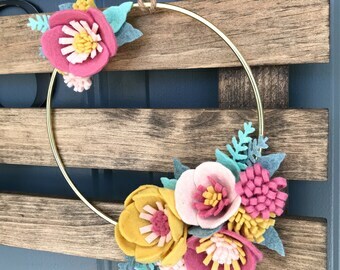 All items are made to order, no pre-made items are on hand. Not intended for children under the age of 12. These products are not toys and should be used for function only. **Colors are shown as accurately as possible and may vary slightly due to monitor and lighting changes. If you have any concerns, feel free to contact me!